Some Say Brave, I Say Crazy! 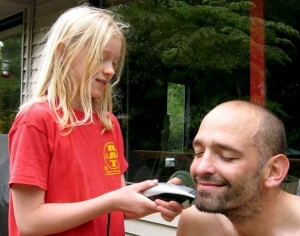 For some reason, my brother decided to let the girls work on his hair and buzz his beard with electric trimmers. Aside from Zelda accidentally removing too much of one of Ian’s sideburns, he came out of the experiment remarkably unscathed. The girls, of course, had a delightful time. In fact, Zelda was having so much fun, she didn’t want to relinquish the electric buzz cutters and got into a minor skirmish with Ian over who had a right to their possession. I’m happy to report that Ian came out on top and Zelda was not allowed to create any additional hair havoc. This entry was posted on Tuesday, July 28th, 2009 at 12:27 am. You can follow any responses to this entry through the RSS 2.0 feed. You can leave a response, or trackback from your own site. *laugh* Are you speaking from experience?